Found along the warmer Bushveld and Lowveld river-areas, especially the northern and eastern borderlines of the Northern Province and Mpumalanga, as well as in a large part of the northeastern KwaZulu-Natal area. With it's lower tusks reaching well above 60 inches (150cm), this animal is well underestimated as a dangerous brute. Some even say that it is the animal in Africa that kills the most people. It usually happens if someone is using his way through the bush when it returns to the safety of the waterhole. It is still disputed if the white rhino really weighs more than this enormous mammal, probably because both species are fairly difficult to encounter, let alone weigh! The hippo can submarine for more than six minutes, but gives away it's presence easily with a typical misty spray when it returns to the surface for a breath of fresh air. It can cover a very long distance by night and eats massive quantities of grass (or farmers weed!) each night. This have caused many farmers to shoot these creatures, thus cancelling its presence in most of the South African rivers. In daytime, a hippo won't wander far from the waterholes at all. In rivers, some small boats and canoes have been flipped over by an hippo on his way to a breath of air, or when there are small hippos around. 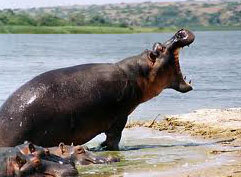 A running hippo is said to reach up to 30 kilometers/h. Extreme and fierce fighting occurs between bulls and they injure one another very heavily. A big hippopotamus won't fear many animals, except, in very rare circumstances, the lion. But smaller hippos may fall prey to the lions and crocodiles.